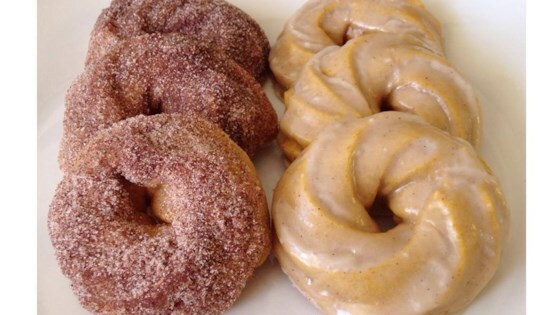 "Yummy baked pumpkin donuts so easy they are great any day of the week." Preheat oven to 375 degrees F (190 degrees C). Lightly grease 2 baking sheets. Stir flour, brown sugar, 2 teaspoons pumpkin pie spice, baking powder, salt, and baking soda together in a large bowl. Mix pumpkin, eggs, milk, and butter into flour mixture; beat until completely incorporated. Spoon pumpkin mixture into a pastry bag fitted with a large star tip with a 1/2-inch opening. Pipe 3-inch circles onto prepared baking sheets. Bake in the preheated oven until golden brown, about 13 minutes. Remove doughnuts to a wire rack to cool. Stir confectioner's sugar, 1/2 teaspoon pumpkin pie spice, and vanilla together in a bowl. Gradually stir in enough milk to reach a glaze consistency. Brush glaze over doughnuts with a pastry brush or spoon over the tops. I loved these doughnuts. They were easy to make and I loved the fact the doughnuts were baked instead of fried. Ive been baking my whole life and everything I have made has always turned out but this did not. Not really a doughnut but more of a cake. Next time I would try a different recipe. These Donuts were pretty good. The only thing is, it tasted more like cake rather than donuts. They had a good flavor though.